We all spend a lot of time on our computers. I most definitely do, and I wish I can minimize contact with mine but it’s just not possible. 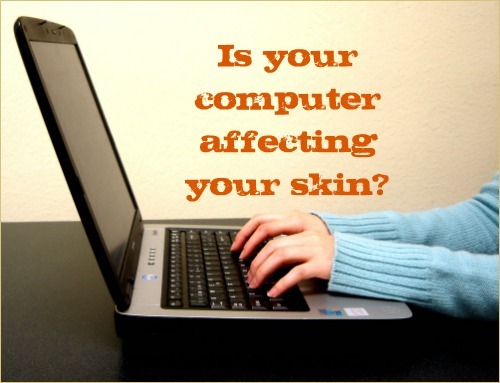 But have you stopped to consider what your computer is doing to your skin? Is it adversely affecting your skin? Maybe not now but perhaps with prolonged usage? While dark eye circles can be hereditary or caused by poor diet, health or a lack of sleep, spending long hours in front of your computer can aggravate the condition. I know for a fact that my dark eye circles become more prominent when I spend too much time staring at the computer screen due to the strain on my eyes. In fact, I also noticed that my eyes can also get puffier than normal. Crow’s feet are the clusters of wrinkles that appear around the outer corners of eyes. When you’re on your computer for too long, your eyes tend to become tired and you tend to blink more or squint and that can contribute to crow’s feet in the long run if you’re not careful. This seems to be a common concern and it doesn’t help that the media are reporting that youngsters who spend 7 – 8 hours on their computers daily are facing pigmentation disorder (source: Indian Express). However, I noted that the origin of the report and wonder if they are still using those large, box-shaped monitors known as CRT monitors that emit low levels of UV light? 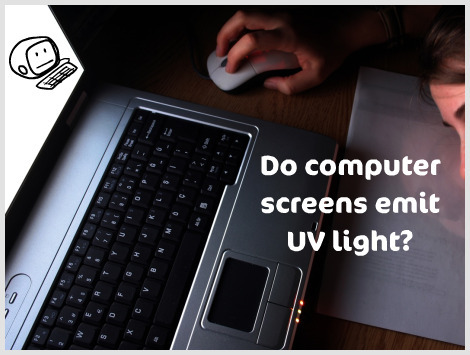 Based on my research and even discussions with my husband who is well versed with monitor displays, most of the flat-panel, or LCD monitors on your desktop computers or laptops have not been found to emit any UV light (source). So your LCD TV is safe too!Â In fact, an anti-glare computer screen is standard on most LCD monitors these days so there is nothing to worry about. Okay, this is very interesting because some of us prefer mobile computing and that possibly means carrying your laptop into your bed. Now, are you balancing your laptop on your knees or tummy? Well, you really don’t want to do that as the heat generated by the computer can cause permanent discolouration of the skin and, in rare cases, cancer. In fact, this condition is termed the ‘toasted skin syndrome’, according to a report from Mail Online that showed a picture of a 12-year-old boy who developed a sponge-patterned skin discolouration on his left thigh after playing computer games for a few hours every day for several months. 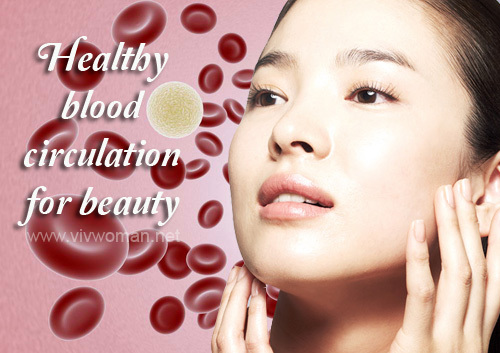 I’ve read some women complaining that their skin tone appears duller when they work too long on their computer and my guess is that it’s due to a lack of blood circulation as they’re seated all day long. This is probably applicable to those with really sensitive skin or who have a medical condition as it appears that some people actually develop pretty severe skin allergies after prolonged exposure in front of a computer screen. Some of the symptoms sounds kind of alarming according to articles found here and here. While it’s impossible to avoid using your computer or laptop, but just note that you should not be spending long hours in front of the screen. Take frequent breaks, drink lots of water while working, and use a sunscreen if you’re worried about skin pigmentation. Should I wear sunscreen in front of my PC? China Celebrity Fan Bingbing wears sunsceen even when sitting in front of computer 8 things to know about the skin around your eyes How does poor blood circulation affect your skin? I don’t drink enough water at work – I’m with the public and even with a water bottle, can’t drink often. Plus, the restroom is not nearby. I would say I’m in front of the computer at least four hours a day. Surely something to think about. I read about about the laptop toasting – a good reason to put your laptop on a desk – with a vented “cooler” instead. I see…try to take sips whenever you can. And certainly agree about using laptops on the desk. Can definitely attest to the puffy eyes and dark eye circles. Was spending an inordinate amount of time last week in front of the laptop both at work and at home. Had the worst circles ever, even with sufficient sleep! Yeah, I find my eyes looking worst on days when I have stared too long at the screen. You’re right that sufficient sleep won’t eliminate them either. I major in Computer Science and needs to face the computer screen almost every day. I think my dark eye circles are due to lack of sleep, sleeping late and facing the screen for too long.Its very hard not get dark eye circles. I know…just try to take frequent breaks when you can so that your eyes won’t be so strained. Definitely had worse pigmentations and dark circles ever since I started using the computer for long hours. Currently, I spend more than 9 hours a day in front of the PC. What type of computer screen are you using? I’ve got a laptop in front of me and an LCD screen beside me. When I turn towards my back, there is another big LCD screen waiting for me to look at.. I’m not a graphic artist but I’m surrounded by a lot of them and most of the time, the only reason for me to leave my own desk is to look at somebody else’s computer screen, lol. Hmm…you’re using LCD screens and still find pigmentation problems? Well, something to think about. I think the night time usage is a problem cos we usually don’t use sunscreen in the night. Well I’m out of luck. lol. I’m majoring in Graphic Design…that is pretty much computers all day! Yeah, same here! I mean, I’m not in graphic design but with blogging and other work, I use the computer all day long. Good thing you’re using a LCD monitor…that’ll help a lot. Just remember to take breaks in between. Well, I use the computer a lot but I try to drink a lot of water. I always bring a 1L bottle with me, whenever I need to use the notebook/pc and even when I go out. As for radiation, that actually varies by the model number, I think. All computer equipment emits varying levels from low to really high. As for the electro hypersensitivity thing, interesting to know but I think the side effects apply more for those who’re ultra sensitive towards electronic or even electrical products. Plus, some people with certain psychiatric conditions could also fall under such a group as they might respond to certain noise levels, certain types of colours, certain type or level of lighting, etc. Ah and also, I may have suffered dark circles from staring at the screen too much but pigmentation? No leh… been using computers heavily since I was a child and I didn’t get that. I literally spent up to 12 hours sometimes staring at the CRT screen. My skin has also been very very sensitive even before I started using computers at all. I don’t think it got much worse. I have no idea about the model number but you’re right about the radiation. So if you’re using a desktop, then best to place the desktop further if possible. I think the flatter LCDs are pretty safe…I don’t get the usual static when my hands are in contact with them. Good for you that your CRT monitor did not cause any pigmentation. It may not apply across the board but it can happen for some. I also wonder if the distance between the monitor and you make any difference to the amount of radiation absorbed? Actually we’re pretty fortunate that we can use these equipment that help us improve productivity normally. Those with health conditions or severe skin allergies due to their health condition don’t have it too easy. Good thing it doesn’t apply to all but only very extreme cases. Oh yes, I think that goes with your sitting posture too! I think too much computing time has caused lines on my neck! oh, i wish i could also lessen my time in front of the computer but my job requires me to sit in front of the computer for the whole day! waaaahhhh….. I understand…it’s modern day technology that we can’t live without. Just try to step away on and off and don’t overstrain your eyes. Yeah, we used those when we were using CRT monitors…they help! Now I know why my skin has been looking so dull lately! What do you think about “standing” desks? Do you think they could help? If what you’re referring to is what I think, then I suppose the distance help to prevent the radiation. As always, too much of anything can rarely be good! I must have been spending on an average 10-12h in front of a PC monitor for the last 20+ years so I don’t know if I can draw objective conclusions about how it has affected. Yes, it has a bad effect on our posture! Also contributing to still neck & shoulder plus backaches! Try eye exercises. I read in an old book to make your eyes seem brighter. But it also improves your vision. You look up as far as you can with just your eyes , the down, left, and right. Holding each for about 8 seconds. Then you roll them around in circles. Another one is holding up your finger and focus on a point behind it. Well, it may or may not depending on skin types too but just know and try to ensure your screen is LCD type. Amazing article, i had never though about it. Time after time i find many thing that are harmful for our health, but the problem is that computers play huge role in our life. It will come as a surprise to some readers that computer use is affecting women in these areas. This is a very informative post. Yes, I am very upset about it. I am working 10 hours everyday in computer. When I am very busy with work it affect me very much. I was very upset what should to do. Now I have got your valuable post. I am sure if I take your idea as my rule. I can solve the problem.